We’ve all seen films and TV shows that depict the future of society. In those fictional settings, directors and scriptwriters imagine a world dominated by helpful robots making life easier for citizens. In a world where technology is advancing faster than ever before, is it any wonder that the thought of robotic deliveries is paramount? Many experts in the seventies and eighties predicted technology was likely to come to fruition in the next fifty years. As we reach the end of that half-century, it is becoming a reality. Firms are now increasingly looking into the viability of automated delivery. Does this mean we are going to see parcel robots roaming around the streets anytime soon? That’s unlikely, but with the rise of driverless technology and sophisticated drone programming, the use of automation in the delivery service seems inevitable. The question remains, is there a demand for it and how safe will it be? One of the major advantages of delivery robots is that they will allow firms to provide same-day, last-mile drop-offs to businesses in the surrounding area quickly, efficiently and, most importantly, cost-effectively. Another advantage of the development of this technology is the real-world problems it can solve, such as supplying our troops in foreign countries or delivering aid to hard-to-access regions during times of catastrophe. The delivery bots currently in development feature built-in pedestrian awareness that operates using learning algorithms. This allows the robot to survey the surroundings and obey traffic laws, use roads, curbs and even stairs, all while avoiding obstacles on its route. It’s not only in small, last-mile delivery robots that this technology being developed. 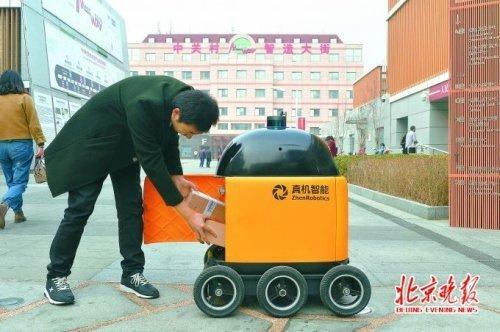 Companies in China are also looking into the logistics of using automated delivery vehicles that can follow a route safely and avoid obstacles and other road hazards. These trucks will be predominantly self-operating, though can be manned if needs be. The major question raised by driverless, automated delivery is, will it be safe? One of the biggest concerns surrounding the technology is the practical implications. Of course, developers are pointing to the fact that yes, autonomous delivery will be safe as both the large delivery vehicles and smaller delivery robots both have hazard perception software and are developed with road users and pedestrian safety in mind. Current government statistics point out that 94% of all traffic accidents are down to human error in one way or another. That statistic alone suggests that a robot designed to eliminate this error will result in safer journeys. Indeed, the driverless vehicles will not be impaired by drugs or alcohol misuse, can have their speeds restricted, and are being developed to read other drivers’ intentions, all implying these autonomous delivery services will be as safe as possible. There are several reasons why customers are already warming to the idea of delivery robots. Firstly, in a society where everyone wants their goods yesterday, people are open to the idea of finding a cost-effective way to get their goods delivered with the minimum of fuss. The bots can work around the clock within reason (i.e. battery life) and can therefore deliver at times that might otherwise be considered premium or outside working hours, for a reduced cost. This also opens up the market for people who work irregular shifts who ordinarily would not be able to receive deliveries during normal working hours. Secondly, driverless technology in delivery vehicles could reduce the requirement for double manned teams on long distance journeys. Without the need for human rest periods, this may speed up delivery times for major companies and large shipments. Finally, as the world becomes more eco-aware, the desire to do something about pollution and global warming has risen, especially among millennials who, incidentally, tend to be the highest demographic wanting same-day delivery. As a result, the fact that delivery robots are far eco-friendlier than vehicles and driverless vehicles are eco-friendlier due to more efficient driving, the whole delivery system could be far more environmentally friendly than it is now. This is a bonus for those investing in automated technologies because it attracts a young demographic of customers who care about their carbon footprint. Why Aren’t Our Streets Already Filled with Delivery Robots? There are companies developing autonomous delivery services around the globe and there are plans for testing in the very near future. Small, same-day delivery bots are being tested in the U.S in Memphis, Tennessee, among other areas. Trials in London of driverless deliveries have also had positive responses thus far. As more and more people flock to cities to live and work, convenience is becoming a sought-after luxury and this new technology could help to deliver that in a sustainable way. One of the minor drawbacks currently faced is the fact that there needs to be a human operative onboard the delivery vehicles or at least supervising to ensure smooth running and, in some cases, the safety of the goods on board. To train an operative to monitor the system and control delivery robots when needed means that more training is needed in the logistics service than previously, meaning that it’s slower to get the technology rolling out than perhaps would be liked. In addition to this, while larger companies are testing vehicles and getting positive results, there’s not enough money being invested in delivering this technology at the moment, slowing the progress somewhat. However, self-driving delivery vehicles are being tested in China and have successfully managed to deliver some 60,000 parcels over an astonishing 2,200 miles. The trials were carried out through several different landscapes and weather conditions, both day and night, and the results seem to have been quite positive. As nations across the globe continue to face the continuing driver shortage, we stand on the cusp of this technology which could be a viable solution. While we are not currently greeting delivery bots at our doors and out in our neighbourhoods, it is surely now only a matter of when this will become a reality, not if. This entry was posted on Friday, January 19th, 2018 at 8:03 pm	and is filed under Courier Services. You can follow any responses to this entry through the RSS 2.0 feed. You can leave a response, or trackback from your own site.